Looking for to make some lean muscle gains in the gym? You might also want to stock up before hitting the gym hard in January after gorging yourself on everything in sight at Christmas or looking for some gift ideas for Christmas for the hard to get for brother or partner. 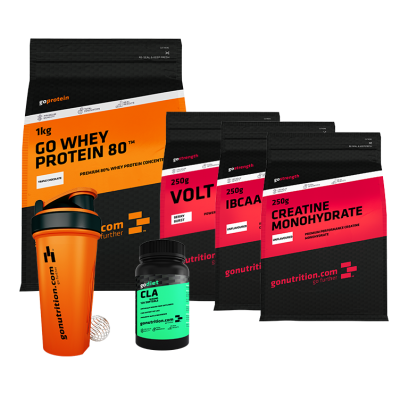 Check out the new sports nutrition brand GoNutrition from the founder of MyProtein as they have only recently launched and you can get a Lean Muscle Bundle for a discount price of just £39 instead of £64 using the discount code T40 at the checkout. GoNutrition also offer free delivery on orders over £50 so i’ve just ordered the discount GoNutrition Lean Muscle Bundle including 1kg of GO Whey Protein 80 with 20g of whey protein per 25g, Volt pre working drink, Creatine Monohydrate for increased strength and explosive power, CLA for weight loss and a shaker bottle and i’ve then added 1kg of unflavoured Go Whey 80 for making protein pancakes to my order taking it over the £50 threshold by £1 for free delivery. Make sure to add the GoNutrition discount code T40 at the checkout before submitting your payment otherwise the discount will not be taken off your order. Check out the GoNutrition website for the Lean Muscle Bundle discount or to see if anything else takes your fancy if you have other gym goals such as weightloss, increased mass, increased strength or they have special bundles for fighters and MMA lovers as these currently have a discount on them too without the need of a discount code at the time of writing. Alexander McQueen x Puma Street Climb Mid III Moonless Night Trainers Do wrist wraps help in Crossfit?